In 1932, Alice Lidell Hargreaves, the inspiration for Lewis Caroll's Alice in Wonderland met Peter Llewelyn Davies, one of five brothers for whom JM Barrie wrote Peter Pan. John Logan's play Peter and Alice is a fictional account of that meeting starring the actors from his latest Bond film, Skyfall for which he wrote the screenplay. Judi Dench who plays Alice is James Bond's 'M', and Ben Whishaw is 'Q'. Both Alice, now 80, and Peter aged 35 and head of his own publishing firm, have had their lives altered by being associated with the children's book characters that have formed a part of the childhood of so many others. Their meeting has been engineered at an exhibition about Lewis Caroll, the pen name adopted by the Reverend Charles Dodgson. The play centres on what it means to be grown up as Peter Pan was famously the boy who never grew up. Alice is more sanguine about her childhood experiences than the real life Peter and of course Judi Dench is the queen of magical performances, her distinctive voice effortlessly conveying emotion and real depth. There have been terrible tragedies in Peter's life — from the early death of both parents from cancer to the casualties of the First World War, which also took two of Alice's three sons, to losing his Oxford undergraduate brother, Michael aged 20, drowned at age 20 in 1921 with a close friend. A question remains as to whether this was suicide or an accidental drowning. 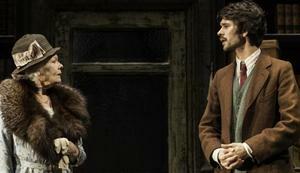 Ben Whishaw is made for tragedy. Here slightly unkempt, unshaven and scruffy, he plays a depressed man who suffered from shell shock in the war and who has no joy in his life. He has lost any magic of childhood and he wants Alice to reveal the truth. As he requests this, Christopher Oram's realistic dusty and distressed bookshop set raises to reveal a Pollock's toy theatre set with the coloured scenery that was sold for children to colour and mount a production with cut out characters moved in on sticks. The wings of the theatre are dominated by drawings from Alice in Wonderland and characters from Peter Pan and we meet their creators, Lewis Carroll (Nicholas Farrell) and then with the scenery changing from Oxford to London's Kensington Gardens, James Barrie (Derek Riddell). We see Alice as the 80 year old engaging with her young self, or rather with a character taken from the drawings of Alice by John Tenniel that are so familiar. Ruby Bentall is perfect to the last crimped hair and the Alice band named after her. Then in flies Peter Pan (Olly Alexander) and Peter Llewelyn Davies talks about trying to escape his Peter Pan connections and image. "We were his to exploit," is his sour interpretation of the relationship with Barrie that followed from a chance meeting in Kensington Gardens when Peter was still in a perambulator. A newspaper headline was "Peter Pan joins the army". Although the new characters enliven the play, there is still much wordy biographical detail and little by way of dramatic action which makes even the 90 minutes seem to drag in places. The other problem with Logan's play is with the background to "The Lost Boys" and Alice's relationship with Dodgson. Both writers have been accused of paedophiliac tendencies which have been the subject of television documentaries and filmed fictional accounts. Peter Llewelyn Davies says here Barrie did nothing physical to the boys but he was a controlling "father figure" after the deaths of both parents of the five Llewelyn Davies boys. Peter resents having been as a child, "forced into emotions you don't understand." The deaths of so many are very sad. The character of Peter Pan (Olly Alexander) reads the roll call of the deaths in the war as Alice sheds tears for the loss of her sons. Alice describes her acceptance of the proposal of marriage from Reginald Hargreaves with a regretful nostalgia as to what might have been, lost chances. There is a bizarre ballroom scene where Alice dances with Reggie, Barrie with Carroll, young Alice with young Peter. You will want to see Peter and Alice for the detailed contrasting performances of the eponymous roles; Alice quietly accepting her lot but with melancholy, now in old age finding it hard to pay for her home, and Peter raging against Barrie's intervention in their lives. There is an emotional punch to the final scene which really hurts.